ReadFresh lets you keep track of your favorite websites in real time. You add the websites to ReadFresh that you want to track. ReadFresh will continuously monitor them. 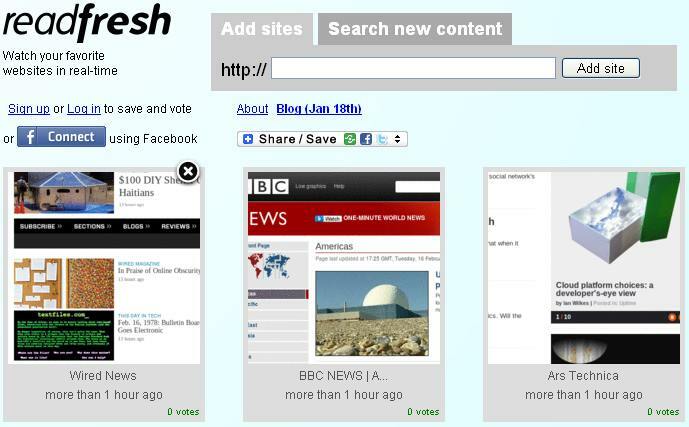 If some website adds new content, ReadFresh brings that website to the top of your list of websites. ReadFresh is like a new incarnation of RSS feeds, only better. Many of us keep track of updates to our favorite websites using RSS. However, let’s admit it, it’s not that much fun to read your favorite website in RSS reader, as compared to the website itself. Moreover, some websites do not even have RSS feeds. ReadFresh solves both the problems. ReadFresh is a free website. When you go to ReadFresh, you can add your favorite websites that you want to track for updates. ReadFresh nicely arranges those websites in form of icons on its page. Whenever any of that website posts new content, ReadFresh will shuffle that list, and will bring that website to the front. In this manner, you will always know which websites have the latest content. To read the latest content, just click on icon of that website, and ReadFresh will navigate you to that. You do not need to keep ReadFresh open all the time. ReadFresh places cookies on your computer. So, whenever you open ReadFresh, it will automatically show you the websites that you had selected. If you not not a big fan of cookies, you can create a free account with ReadFresh, and then ReadFresh will be able to store your preferred websites. Another advantage of creating an account is that you can login to ReadFresh from any computer, and still keep track of your favorite websites. ReadFresh has also integrated with Facebook, so you can directly login with your Facebook account, without a need to create a separate login. Then, you can also share your updates with your Facebook friends. I really like ReadFresh, and I am sure I will become a constant user of it. ReadFresh is completely free, and you do not need to download or install anything to use ReadFresh.